The B7A2 Ryusei is a Rank III Japanese naval bomber with a battle rating of 4.3 (AB/RB) and 4.0 (SB). It was introduced in Update 1.37. The B7A2 was designed as a carrier-based dive/torpedo bomber. For an aircraft of its size, it has exceptionally good manoeuvrability, on par with the A6M Zero. Therefore it can be used in the fighter role as well, since its 2 x 20mm cannons perform very well against all other aircraft. When using the B7A2 in either dive or torpedo bombing, it is important to not rely on the B7A2's defensive gunner if an enemy is approaching. The B7A2 can quickly outmaneuver most American and Russian aircraft so use this to your advantage if you're being intercepted. You will then be able to quickly tail your enemy, and be able to engage them with your forward firing cannons. As the aircraft is seen, it is a very big target, with minimal armour. This is why it is important to not rely on your defensive gunner. In addition, the B7A2 does not have a very good climb rate, and works best at lower altitudes. Getting your guns on target can also be a pain, especially when traveling at higher speeds since the B7A2's roll rate is very poor. Most enemies are able to easily out roll the B7A2, giving them a distinct advantage in a dogfight. Nonetheless, many pilots do not expect death to come from a dive bomber. The B7A2 wields two 20mm Type 99 mk 2 cannons placed in the wings. Since the B7A2 can be used as a multi-purpose aircraft, the B7A2's weapons will also serve those roles. Equipping the ground targets belt for the 20mm cannons can be helpful if attacking targets like light pillboxes or light tanks. The Ryusei is also capable of equipping the "Stealth" belt which is composed entirely of HEF and API shells. This belt is the best choice for air to air combat. The B7A2 pilot should remember to set his or her gun convergence lower than 400 meters to take down enemy fighters effectively. Since the cannons themselves are a fair ways apart from each other on the actual aircraft, having a low gun convergence ensures each round hits a single point on a target. The Ryusei is best utilized as a multi-role aircraft, similar to the role the Ju 87 D-5 plays. Once its payload is dropped, the B7A2 becomes a low altitude, low-speed dogfighter similar to an A6M. In realistic battles, the B7A2 is often paired with aircraft such as the A6M3, A6M3 mod. 22, and A6M3 mod. 22Ko. If unable to shake an enemy off your tail, these "Zeroes" can be relied on as they have impressive low altitude capabilities. Payload choice is dependent on target choice. If the target is a light pillbox, for instance, one does not need an 800 kg bomb. Instead, equip either of the other bomb loadout options. The same goes for most ground units, apart from arcade mini bases. 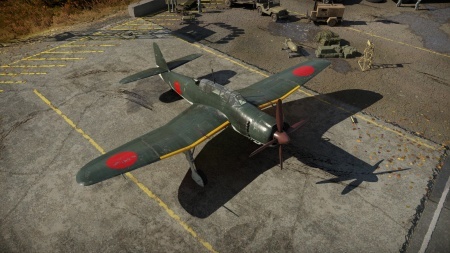 The Ryusei is similar to aircraft such as the Ki-49-IIa in that it can "hover" above an enemy base or airfield, rapidly dropping its payload and diving up to altitude again. Since the B7A2 is a dive bomber, it does not have to be level to drop its payload accurately. The Ryusei's ability to "hover" above enemy mini bases and airfields can be a great help to any arcade battles team. Upgrading the crew reload speed makes this aircraft a potential game-winner, especially when in a squad. 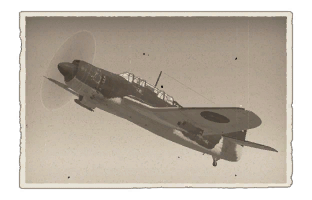 Similar to the Ju 87 D-5, the Ryusei's airspeed is not on par with the aircraft it faces, no matter the game mode. This handicaps the B7A2 to playing solely a support role, only being able to engage the aircraft it can catch. Nonetheless, having a B7A2 on any team, no matter the game mode, never hurts. Since the B7A2 is a multi-role aircraft any module research path is viable. Unlocking performance modules will boost survivability and damage potential in dogfights, whereas unlocking armament modules will help with the ground attack. Some of the best modules to unlock are the "engine injection" and "offensive 20mm belts". Two-seat carrier-based Aichi B7A2 Ryusei "Shooting Star" or "Meteor" Torpedo/Dive Bomber (Allied reporting name: Grace). The B7A was an answer to a specification for a carrier-based torpedo/dive bomber in 1941. It was intended to replace B6N and D4Y, having an internal and external payload, increased speed and long-range. Some of the design features of the B7A include; inverted gull-wings, conventional fuselage, and tail unit and a four-bladed propeller. During its development, it went through a series of shortcomings, such as the delivery of engines, and an accidental earthquake which destroyed the main factory housing most of the B7A's. Thus not seeing active service until 1944. By this time, there were no aircraft carriers capable of operating the B7A. The last aircraft carrier being the Shinano was sunk 10 days after its commission. The B7A2 was then forced to operate in home-defence operations, seeing limited service. Known as the AM-23 within Aichi, the first prototype was completed and flown in May 1942 which was designated the B7A1 by the Navy. The B7A used the Nakajima NK9C 12 Model radial engine, producing 1,825 hp. This gave the aircraft exceptionally good speed, even when fully loaded with ammunition and bombs. During flight testing, the Navy was very impressed with its performance. Despite it being a very large light bomber, the B7A1 displayed handling and performance comparable to the Mitsubishi's A6M Zero and a further 8 prototypes were ordered. However, with more testing underway, it was noted that the engine (which was experimental as well) suffered teething problems, and the airframe of the aircraft needed modifying structurally. It was not until two years later that the B7A would begin production in 1944. Up until May 1945, 80 B7A2's had been completed. But soon after, a severe earthquake occurred, destroying the factory housing the aircraft that were being assembled. A further 25 more examples were completed by another factory. Throughout the B7A2's service, different variants were planned. Firstly, was an experimental production B7A2, that was fitted with the Nakajima Homare 23 radial engine, producing 2,000 hp. Only 1 was built. Secondly, came the B7A3 Ryusei-Kai. This was to use the Mitsubishi Ha-43 radial engine producing 2,200 hp but it was not built. Lastly, came the B8A1 Mokusei "Planet". This was to have no carrier equipment and no gull wings. In addition, 2 x Type 99 20mm cannons were to be replaced with 2 x Type 5 30mm cannons. The B8A remained on the drawing board before the war ended, with no mock-up even though it was accepted to be built. In all, 9 B7A1's, and 105 B7A2's were produced. 114 in total. This page was last edited on 5 January 2019, at 14:49.